Kingston's DataTraveler(R) R500 provides rugged portable storage in capacities that let you take all your data with you to the office, school, travel and more. Its durable, rubberised casing makes it easy to grip and protects the drive from scratches and general wear, so it's ideal for road warriors and outdoor adventurers alike. 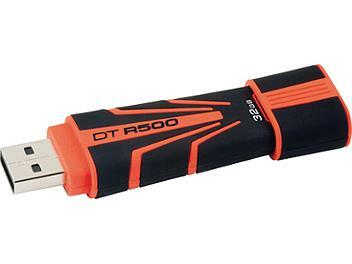 DataTraveler R500 provides high speeds of up to 30MB/s read and 20MB/s write and is easy to use. Its blazing fast speed means you can quickly back up all your documents, even the largest video files, plus travel photos, music and more.